From the back cover: Whether he (Scott) has been in the "In-Group" environs of "The Merv Griffin Show," the youthful tumult of "Hullabaloo," of the "show-biz" glitter of "The Al Hirt Show," Bruce has always performed beyond expectations. 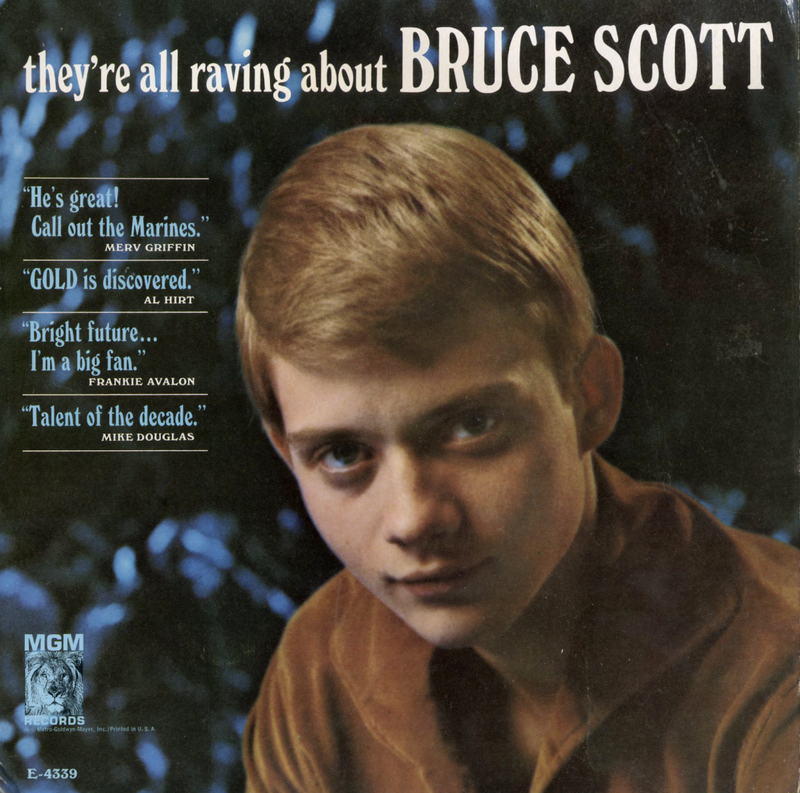 Whether he sang a rock-and-roll hit, an all-time standard or a show-tune, Bruce has invariably received heavy mail from fans saying they felt his version of the song was the best they had ever heard. 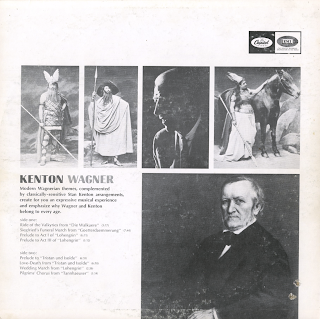 Ride Of The Valkyries From "Die Walkuere"
From Billboard - February 27, 1965: A giant of this ear of music, Stan Kenton has brilliantly and sensitively arranged the great works of Wagner to fit the modern world of music and yet retain their classic quality. An undertaking few could accomplish with such impact and beauty. 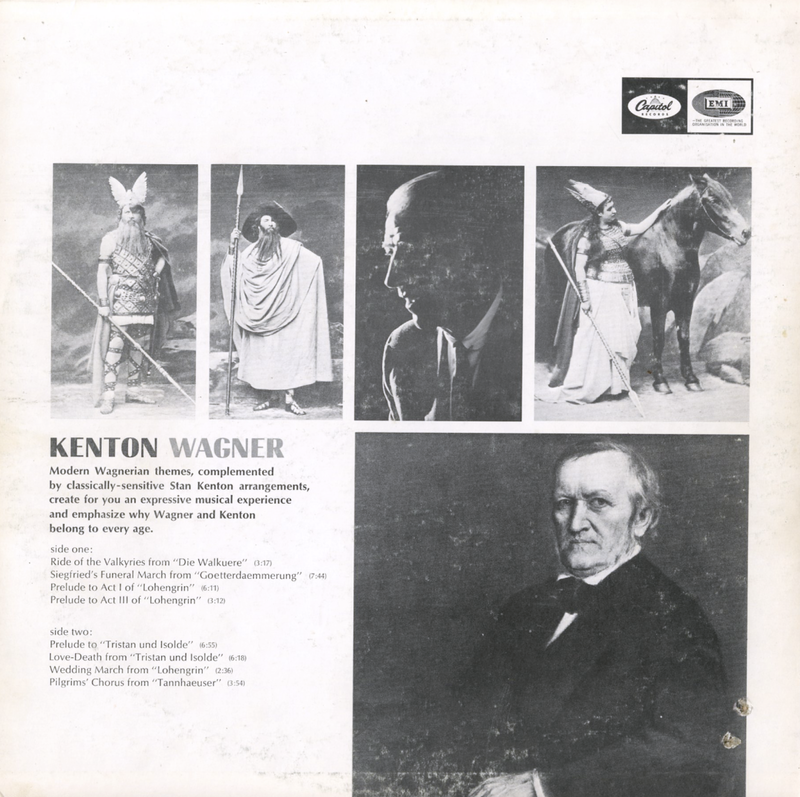 All the fire and drive of Wagner is complemented by Kenton. Prelude and Love Death from "Triston and Isolde" a classic example. From the inside cover: In 1940 after more than eight years of study Kenton began composing and arranging for his own orchestra "Everytime I'd sit at the piano and begin writing," said Stan, "I'd think about all the things Ravel and I discussed that night. 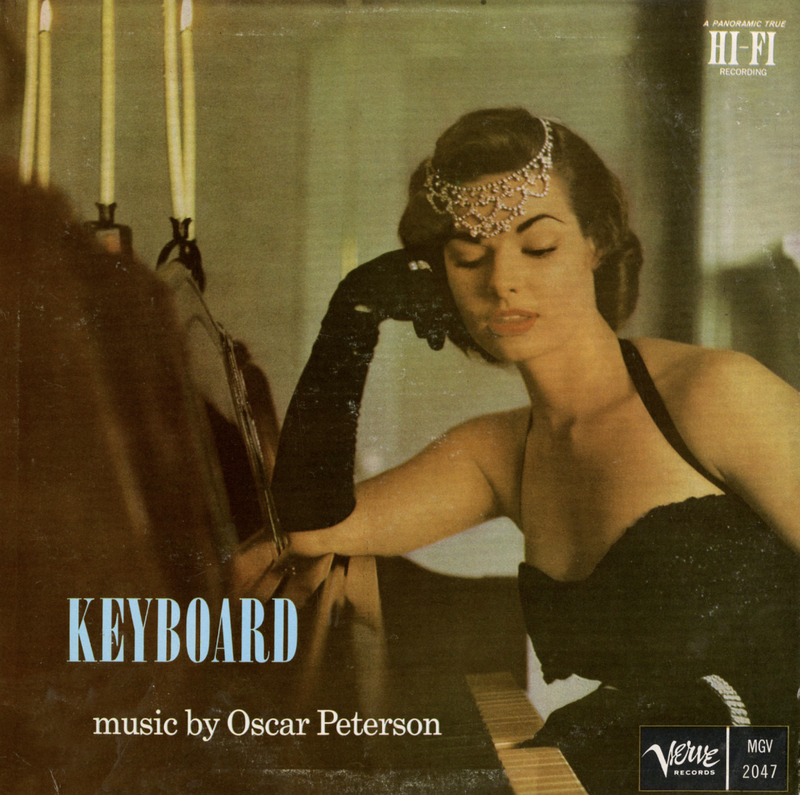 In fact, he was the stimulus for two of the things I later wrote for the Artistry In Rhythm Orchestra. I think if he had lived he would have enjoyed analyzing the structure of Artisty In Bolero and Fantasy." 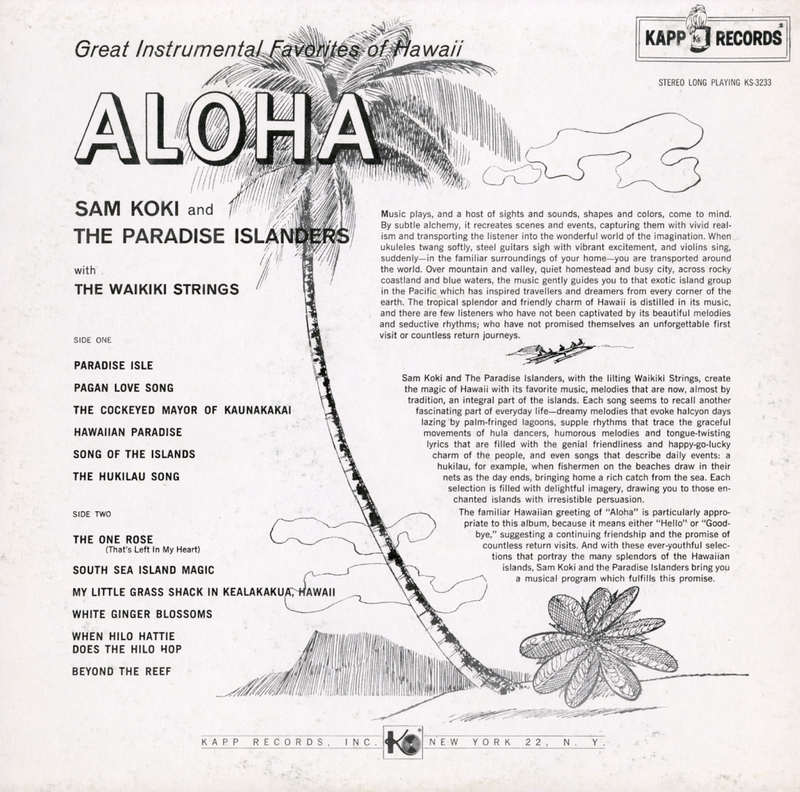 Over the next ten years Stan and chief arranger Pete Rugolo became convinced that the only way to make their modern music survive as to experiment with the complex ideas of the classical school and to fuse them along new thematic and harmonic lines. "If I had stuck to the original music that Pete and I wrote for the Artist In Rhythm Orchestra," said Stan, "I'd probably be the richest man in music today. But Id also be the most bored!" In addition to jazz and dance arrangements, Kenton and Rugolo added concert scores to the library which were inspired by the writings of Ravel, Debussy, Hindemith, Stravinsky and Schonberg. By 1949, Kenton's intense urge to communicate musically on as many levels as possible again caused him to re-evaluate his creative perspective. Even though his music had been accepted as one of the post provocative art forms of the twentieth century, he still sought new methods for breaking down the harmonic barriers which had crippled contemporary music for so many years. 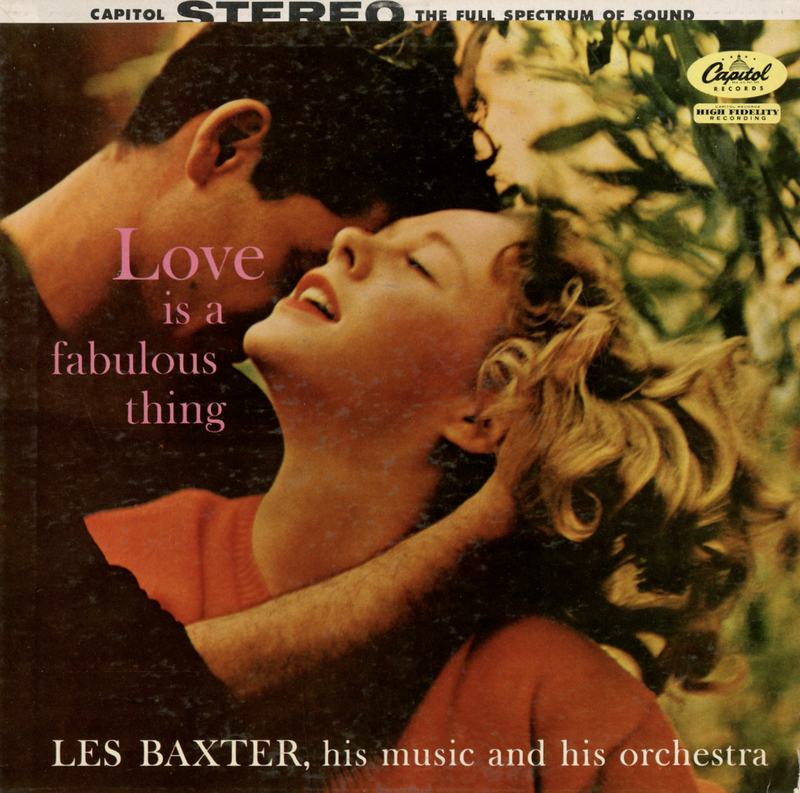 If his music was to speak for of textures, tempos and contrasts characteristic of the age, then the range of the Orchestra would have to be expanded. In January of 1950, Kenton assembled a forty-piece orchestra which included violins, cellos, woodwinds, brass and tympani, and commissioned a new library to be written. 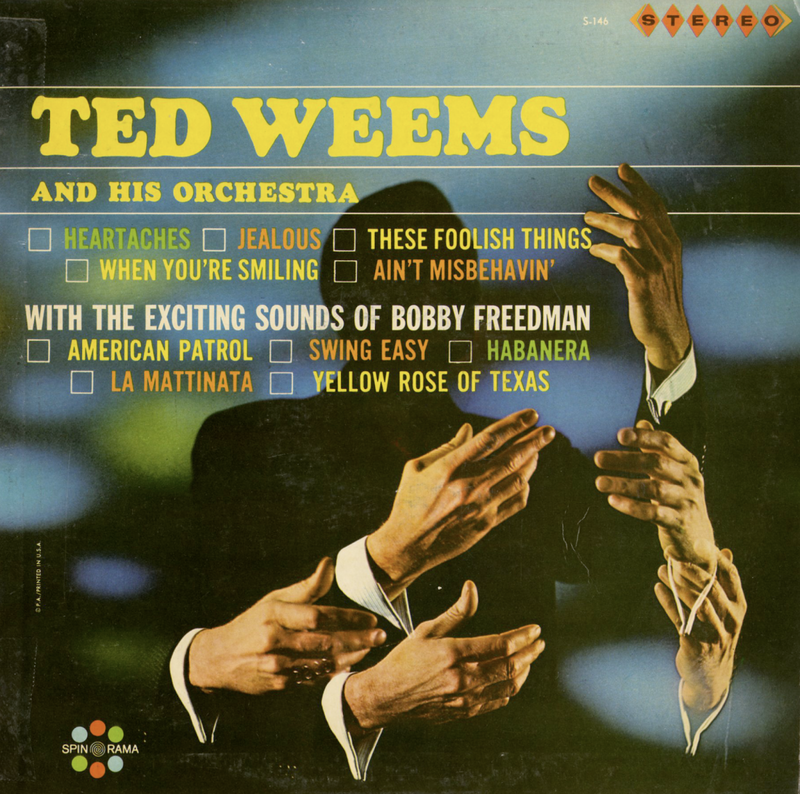 The Innovations In Modern Music Orchestra not only allowed him to present a classical approach to jazz, but proved a big band could remain in existence even though it had dramatically shifted musical direction. Critics thought out the world unanimously agreed that Kenton's neo-classic concert scores had intelligently begun to bridge the gap between jazz and classical music. 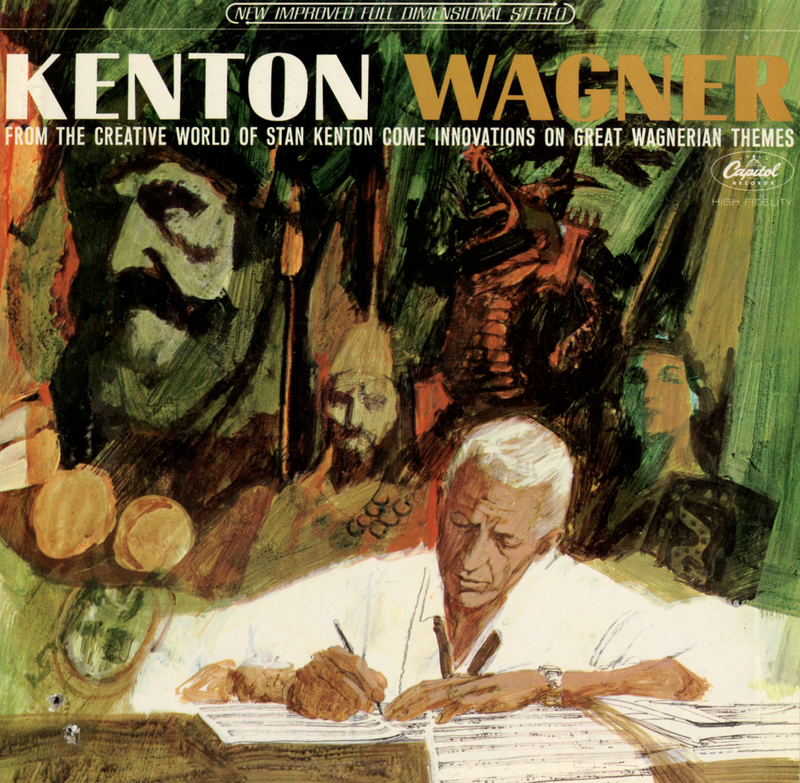 And yet, although the thematic material Kenton wrote for the Innovation's Orchestra made a lasting contribution to modern music, he relentlessly followed his artistic conscience and kept accumulating knowledge in order to project new ideas. By 1964, the scope, subtlety, and brooding brilliance of his music emphasized the sharpness and accuracy of his reminiscences of the contemporary scene. Last winter while preparing a lecture on the influences classical music had on his own written he began sketching out on the piano an arrangement of Wagner's Tristan und Isolde, as it might sound if Wagner had scored it for the Kenton Orchestra. The more he analyzed Wagner's music the more convinced he became that the Kenton Orchestra should record the music of Germany's revolutionary 19th century composer. Ride For The Valkyries From "Die Walkuere"
Siegfired's Funeral March From "Goetterdaemmerung"
Prelude To Act I Of "Lohengrin"
Prelude To Act III Of "Lohengrin"
Prelude To "Tristan und Isolde"
Available from online vendors so I will not be posting a sample. 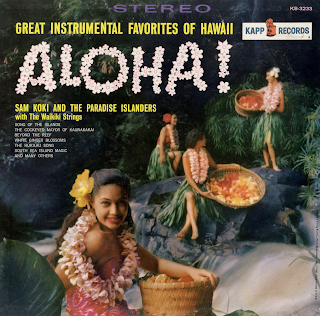 Presented here to share the cover, which does not appear with the online set. 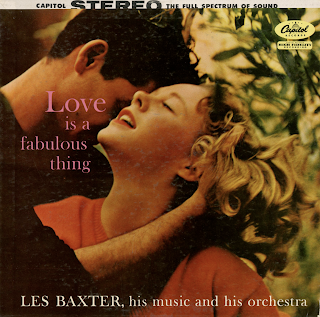 This is the 1957 Verve reissue (black label). From the back cover: In its present form, the Oscar Peterson trio has been together for the last several years and it is increasingly a unit where teamwork is the watchword. 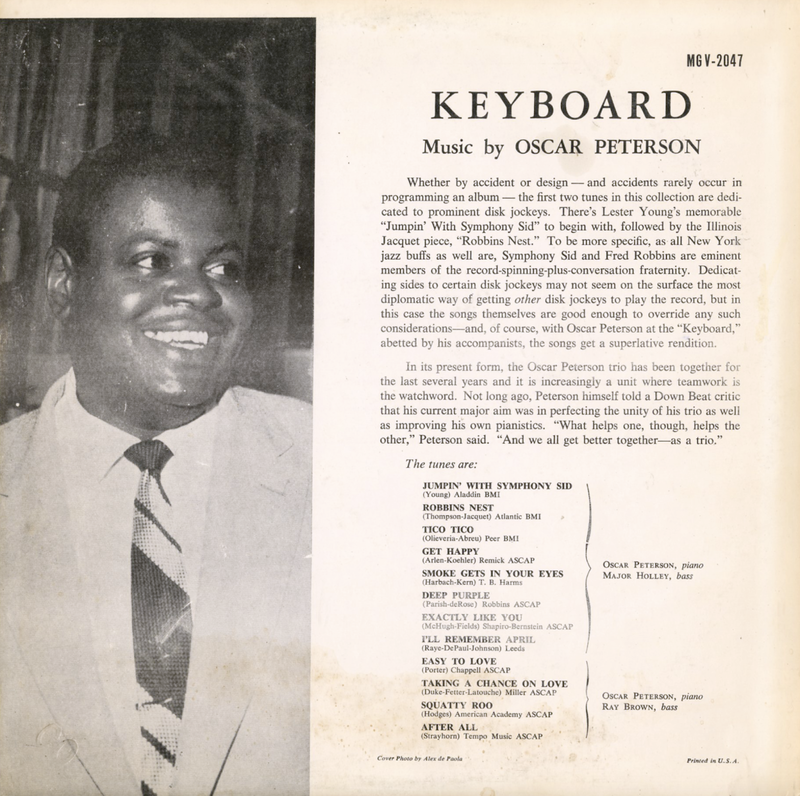 Not long ago, Peterson himself told a Down Beat critic that his current major aim was in perfecting the unity of his trio as well as improving his own pianists. "What helps one, though, helps the other," Peterson said. "And we all get better together – as a trio." This is the 8 minutes and 13 seconds from the discontinued LP V-8090 which takes up one entire side of that LP. Available from online vendors, so I will not be posting a sample. Presented her to share back cover biographical information. 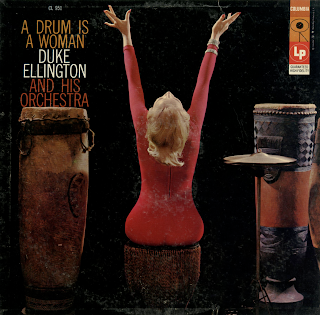 From the back cover: As is customary during any Ellington performance, the individual members of his orchestra are featured as soloists throughtou "A Drum Is A Women." But this record introduces two new stars to Ellington audiences and reintroduces singer Joya Sherrill. Joya, who first met Ellington when she came as a high school student to sing for him and was immediately hired, toured with the band during the mid-forties. She is now married, the mother of two children, and singing in clubs throughout the country whenever her career can continue without interfering with her family life. Soprano Margaret Tynes has heretofore devoted her exciting voice exclusively to operatic and concert appearances. 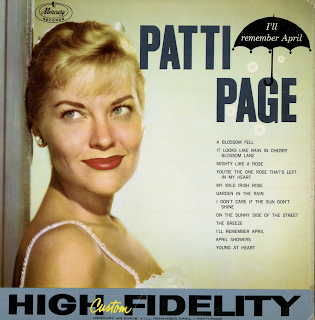 Although she has been heard by many audiences at New York's City Center, as well as in televised opera, she had never sung with jazz musicians before. Having accustomed herself to such surprises as seeing the Ellington brass section waving rubber plungers over the bells of their horns, she is now a through-going jazz fan. Ozzie Bailey is a native New Yorker whose mother and father where born in Trinidad, which accounts for his convincing way with a calypso song. He has been singing in clubs for several years before this introduction to Ellington's great orchestra. As for his plans – he'll sing, and the oftener it's with Duke's band, the better. 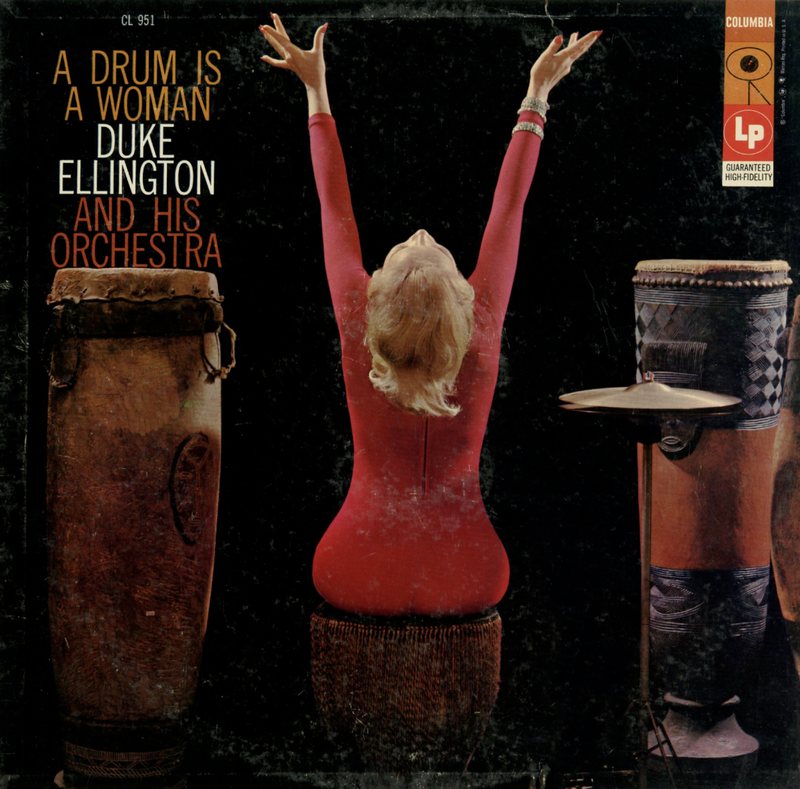 From Billboard - April 28, 1957: One of the biggest album promotion drives has been set by Columbia Records in conjunction with United States Steel and BBDO on behalf of Duke Ellington's fantasy, "A Drum Is A Woman." 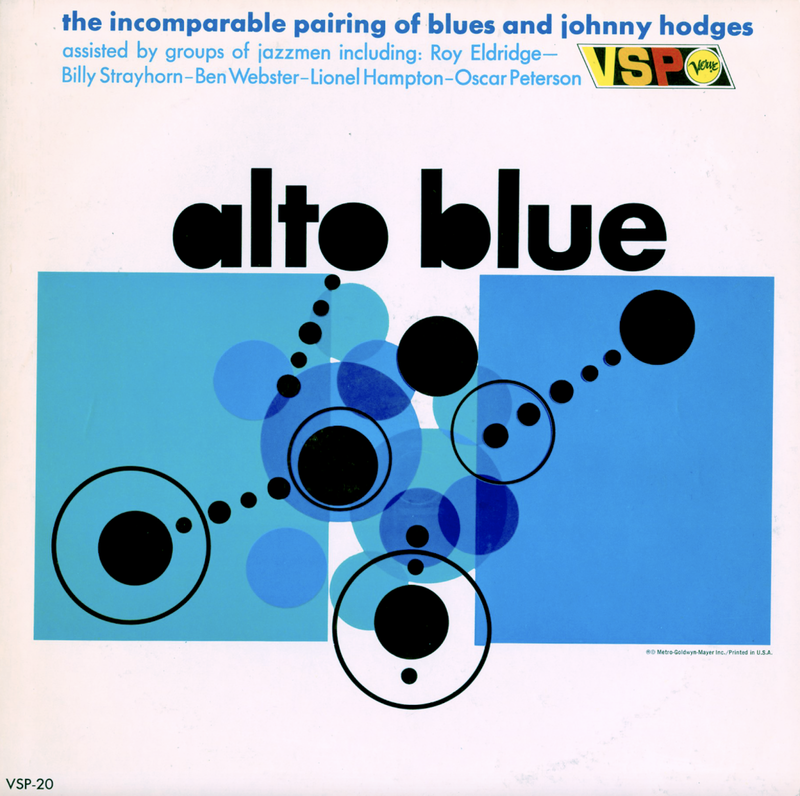 The Ellington opus, regarded as the first jazz spectacular and the first TV show inspired by an album, will be done in compatible color television over CBS on May 8. 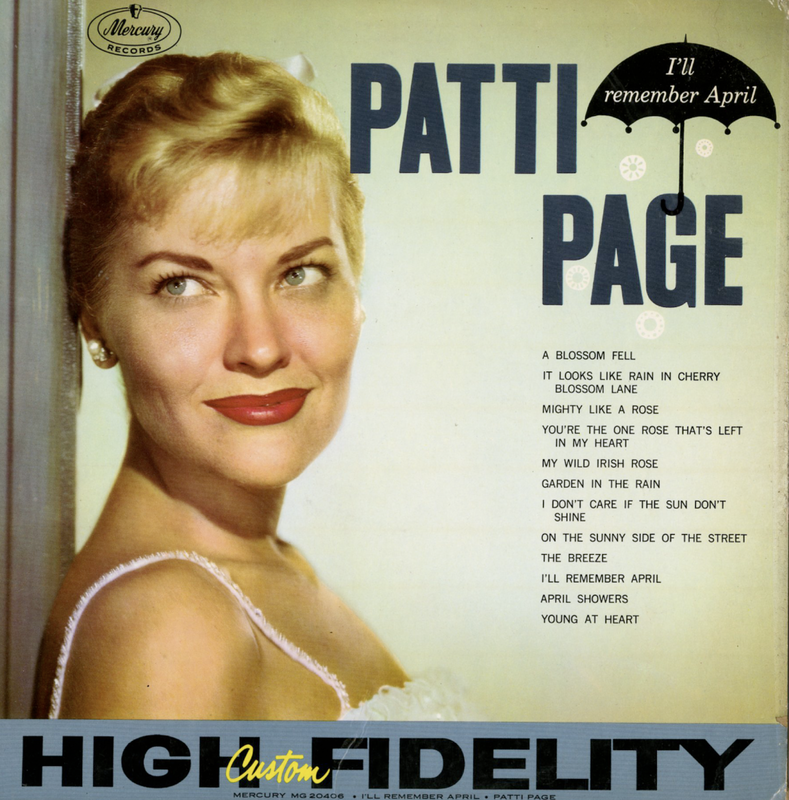 In additon to distributing copies of the complete album within its own organization, U.S. Steel had Columbia mail more than 150 LPs to key city TV editors. 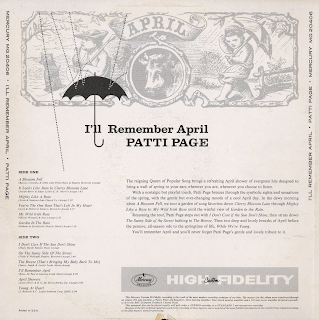 Special audience kits, containing a 45 r.p.m. 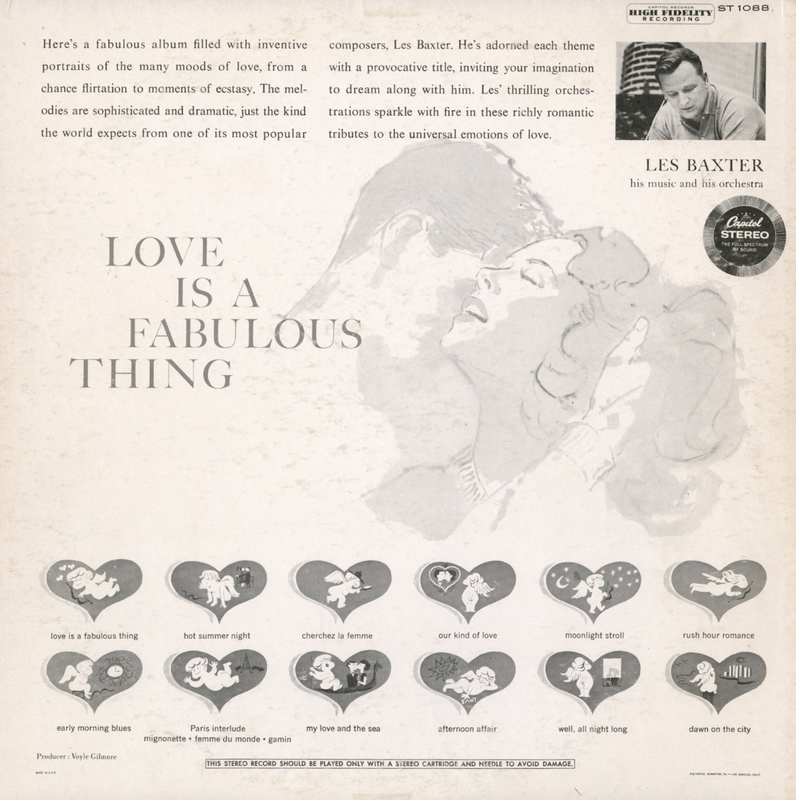 of excerpts from the album, a 12-inch LP of recorded spots by Ellington together with scripts, and a complete brief of the May 8 show, are being mailed to TV program directors. The program managers are also being serviced by CBS-TV with film trailers, mats, slides, etc. Selection radio stations will also be furnished promotional kits and the special 45 r.p.m. record. The 45 r.p.m. did will also be distributed within the U.S. Steel organization. U.S. Steel's ad campaign, of 100-line, 200-line and 600-line size runs from May 5 thur May 8, with key outlets covered, including Los Angeles, San Francisco, Washington, Chicago, Boston, Detroit, St. Louis, Cleveland, New York, Philadelphia, and Pittsburgh. Publicity in national magazines will continue thru the performance date. "A Drum Is A Woman," produced on records and released mid-February by Irv Townsend, will be done on TV by Theater Guild under the direction of Marshall Jamieson. 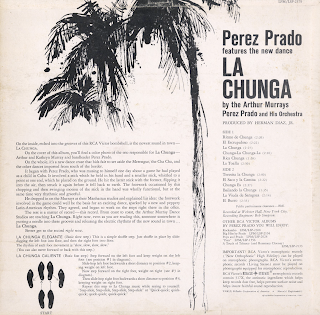 From Billboard - July 30, 1961: The tunes included in this LP by the Prado band from what might be a basic repertoire for an exciting new dance craze. 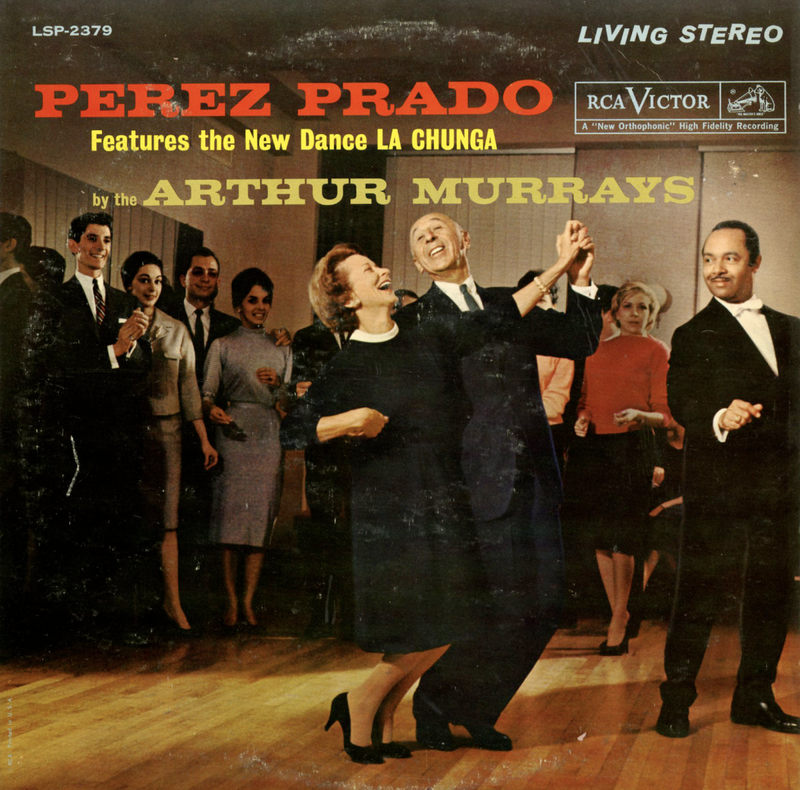 Prado has invented a new dance step, "La Chunga," and the Arthur Murray Dance Studios are teaching it. The exhilarating dance rhythms contained on this LP should get "La Chunga" off to a flying start. They are filled with Latin American swing, fine group vocalizing and splendid, punching organ work reminiscent of Perez' "Patricia" hit. 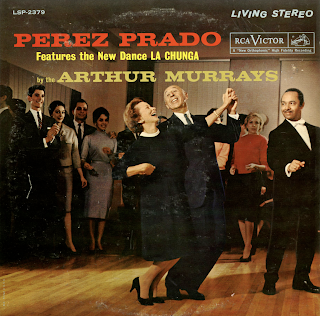 The liner also briefly outlines and illustrates the steps to the new dance; this, along with the Arthur Murray tie-in, should help the sale of the set. 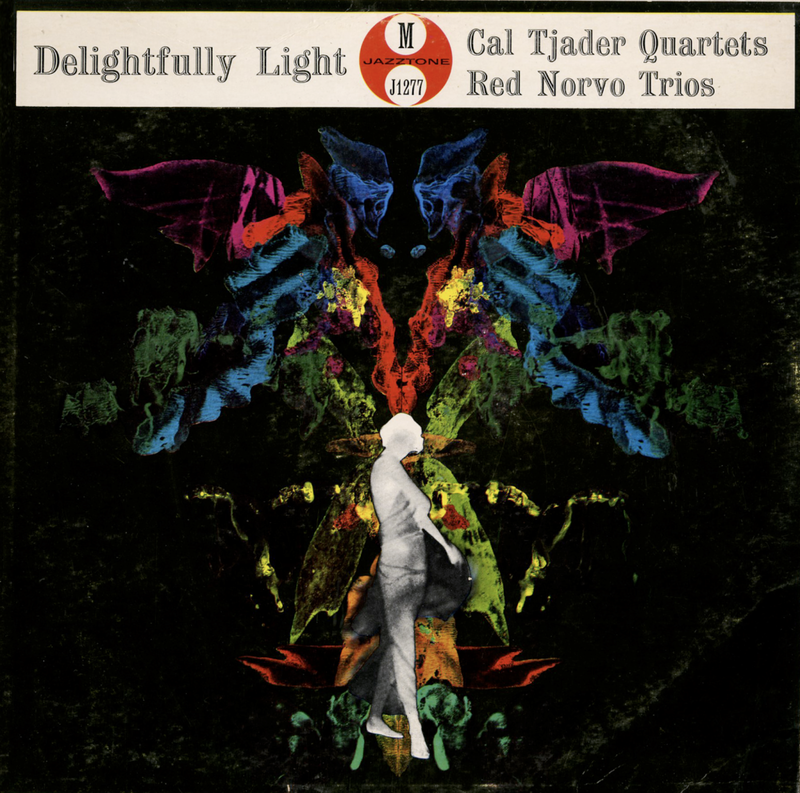 From the back cover: Red Norvo has been making musical jazz for close to thirty years. 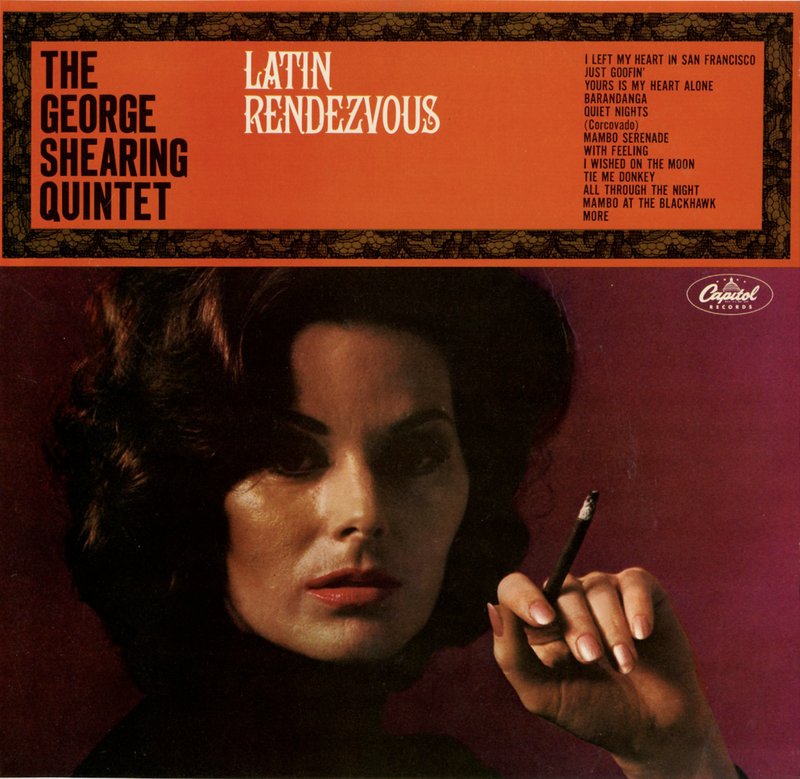 They have been jazz sounds of different sorts, for Kenneth "Red" Norvo began his career as a xylophonist, playing for Paul Ash, Victor Young and Paul Whitman, before he formed one of the great all-time jazz groups in the mid-thirties. 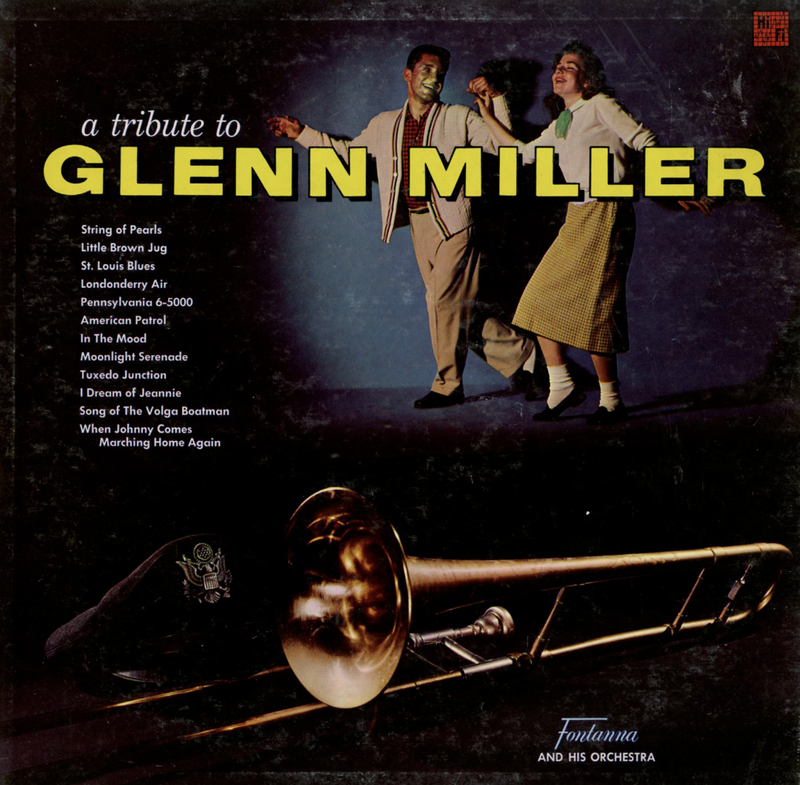 At first it was a sextet (without a piano – and long before Mulligan, too! ), then it became a septet, then a ten piece and finally a fourteen piece orchestra. 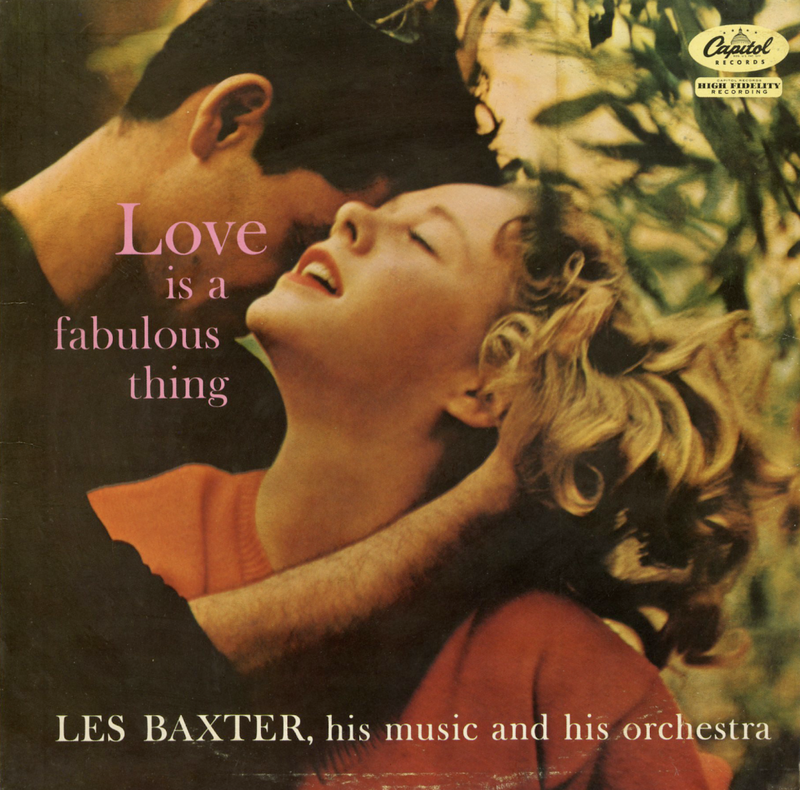 In addition to Red's wonderful, light, always swinging xylophone, his groups boasted the modern arrangements (modern even by today's standards) of young Eddie Sauter, plus the ever-superb singing of Red's first wife, the late Mildred Bailey. Always a musician with a keen ear for changes of every sort, Norvo switched to vibes in the forties, played in Benny Goodman's Quartet, in the first and most famous of Woody Herman's several Herds, and finally settled on the West Coast, where, with his brother-in-law, Shorty Rodgers, he has acted as one of the leaders of the modern jazz movement. 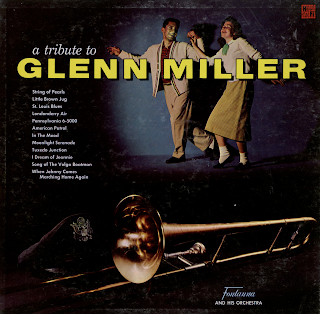 In 1950 he formed the first of several trios, whose recordings, according to Leonard Feather's Encyclopedia Of Jazz, "were acclaimed as the most striking example of subtlety and finesse in modern, chamber-music style jazz." Charlie Mingus was his bassist; Tal Farrow, the Lincoln-faced guitarist from North Carolina whose superb-sounding strumming is featured on two of the selections of this disc, was its third member. 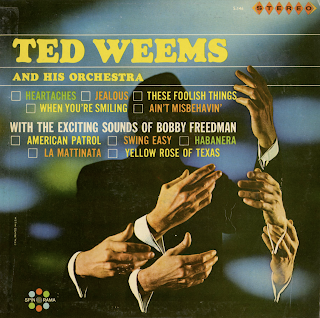 Tal was later replaced by Jimmy Raney, an especially inventive modernist who played in the Herman Herd and later for two years on this disc. Featured throughout all five selections is one of the most exciting and dextrous of today's bassists, Red Mitchell, another Herman alumnus, who has made so many fine records with other top West Coast jazz stars. From the back cover: Cal Tjader was born in St. Louis, Mo., seventeen years after Red Norvo had been born less than a hundred miles away in Beardstown, Ill. A graduate in music and education of San Francisco State College, he was drummer and vibist in Dave Brubeck's trio and octet in the late forties and early fifties, after which he played vibes in George Shearing's Quintet, then formed his own groups which have alternated between swinging, modern jazz and jazz versions of the mambo and other Latin and Afro-Cuban rhythms. 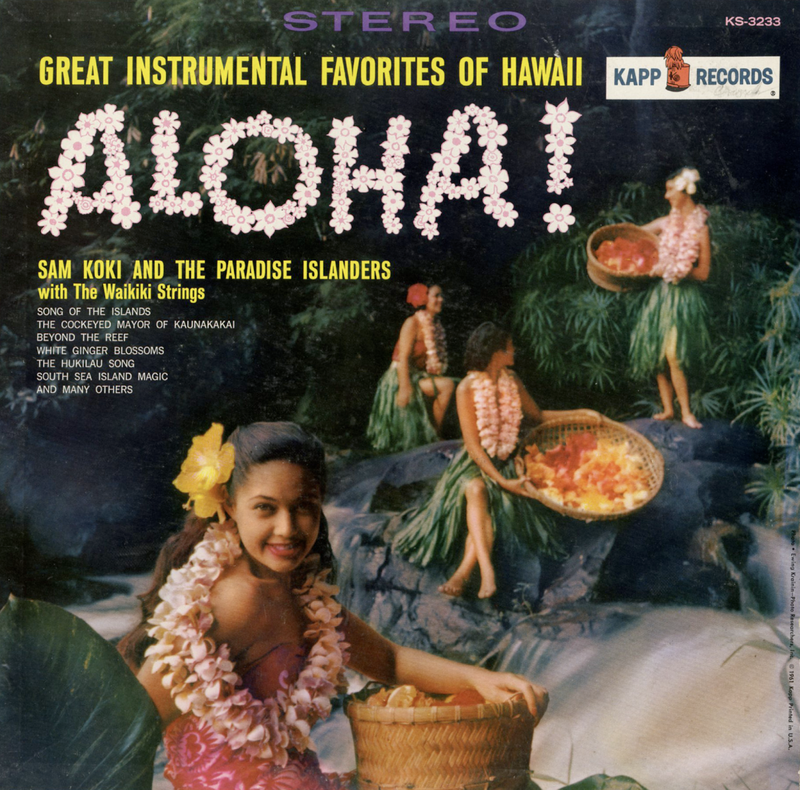 Tjader's avowed favorites are Milt Jackson and Lionel Hampton, though there's delicacy in his style that could only stem from Norvo's original influence. 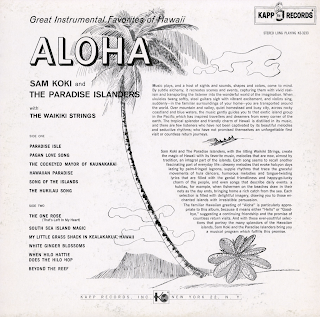 On the first two of the selections on this disc, recorded in Hollywood during May of 1956 he plays with three out-and-out swingers" the very groovy Gerry Wiggins, who has served with Benny Carter, Louis Armstrong and Les Hate, and whose tasty accompaniments have backed several top singers" Gene Wright, who has passed for Basie, Buddy DeFranco and Norvo, and drummer, Art Tatum and DeFranco. On the remaining three selections, cut at the Blackhawk in San Francisco during January of 1957, Cal's Quartet consists of the same Gene Wright on bass, a comparative newcomer, Al Torre, on drums and Vince Guaraldi, once a member of the Third Herd, whose love for playing and swinging (I'm just a reformed boogie-woogie pianist!") is evident throughout all his passages.